ardel had not yet recorded “Mi noche triste (Lita)” (My sad night) but the magazine already distributed song lyrics, also popular poems. With the passing of time, countless sections arose that as a whole, without ending up being a cultural proposal, I presume that they helped in the literacy of many citizens. An Italian boy, almost a kid, was who had the idea. His name: Vincenzo (Vicente) Buccheri. When entering the country with his parents, the employee of migrations changed the family name adding a mischievous vocal more. Since then: Bucchieri. He was born in Italy, in Acate, Sicily, on November 11 1901. He arrived at our country seven years later. And as it was customary at those times of scarce money and a lot of work, very soon the male children should have to go out to earn the necessary coins to complete, among all, the money that allowed them to live with dignity, without starving. So it was that one day, he began to help in the sale of newspapers at a stand the brothers Juan and Rafael Canaro had on the corner of the Entre Ríos and Constitución streets. So he thoroughly knew the huge hall of the Constitution railway station, near the kiosk and then people began to recognize him. They called him Picorete, a diminutive form of Pico de oro (gold beck). Likewise people named the poet Belisario Roldán because of his easy and florid eloquence which Vicente also had. «My old man —his son Pedro says— would have read in some newspaper that the Guatemalan poet Enrique Gómez Carrillo had baptized the famous cupletera (singer) Raquel Meller as El alma que canta (The soul that sings). Something of the sort should have happened because he entitled the pamphlet that was the first number of his proposal like that. «The tango with lyrics was about to appear, the boom were the payadores (itinerant singers) and what they sang. The lyrics of the cuplés (variety songs) were also successful. «The first printing house to which he required its services was called La Protesta. And it was not casual, he was touched by the poverty in comparison with the wealth of some few ones. The spirit of the magazine was its way to protest. Its motto was to diffuse and to promote creators and interpreters. To make known others whose thought coincided with his way of regarding justice. Alberto Vaccarezza used to say: «El alma que canta is read by the President of the Nation or even the humblest farmer». It was the people's magazine. Many poets were eager to send their verses knowing that they would be read by a multitude. Almafuerte once told him: «Take it, son, for your little magazine». That took place on the Constitución station. Likewise did Alfonsina Storni and Vicente Barbieri. The latter wrote in lunfardo in his beginnings. Taking advantage of the success, monthly, some booklets were published with diverse contents. 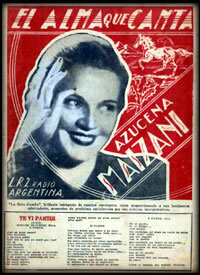 There were some about lunfardo, tango and folk songbooks and other topics. Besides lyrics, some sections were being renewed and others were unchanged; for a wide period the note signed by Dante A. Linyera was never missing. The names of the sections were varied: Last novelties, In the Kingdom of fable, Songs of life, Horse races, Rural breezes, His majesty Mr. Tango, Latest fashionable tangos, His Highness Mr. Shimmy, The idealistic muse, About the Buenos Aires suburb, The secret of the girls. An interesting section was The political tenement house. When Uriburu was heading the government, agents of the régime told him that the above section was not convenient and then it was not published any more. 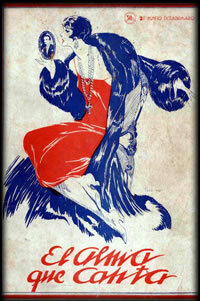 The top number of copies issued was in 1928, 250.000 copies per week. Only when a number was sold the elaboration of the following one began. Another resource was the insertion of the monologues that, at theaters, Parravicini, Muiño or Alippi created. Besides making them known, they made the actors and theater itself more popular. Another section that the reader consumed with avidity was the Sentimental Mail. Some took it seriously and others considered it a joke. Many couples were formed and even married. A saying became very popular: «I'll wait for you with a carnation in my buttonhole and El alma que canta in my hand». They say that it was by 1925 when he was acquainted with a boy with airs of actor and playwright. After listening to him don Vicente told him: «Why don't you put your dreams aside and write for me some lunfardo lines that I will publish in each edition?» He was Dante A. Linyera. Soon later he wrote the editorials. 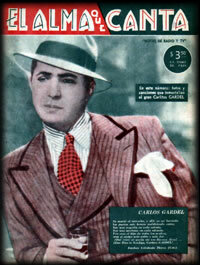 It was also creator of other magazines: Tarascone, a name inspired by a soccer player and dedicated to that sport; Purrete, for children; El espejo de la moda (The mirror of fashion), Micrófono (Microphone), directed by Homero Manzi, whose subject matter was the radio; Cinegráfico, about cinema; Fantasio directed by Julio Escobar. But his supreme work was, the today mythical, El alma que canta that ended up having 64 pages. Financial problems reduced it to only 12, but it was able to recover. Then imitators appeared: El canta claro, founded by the Angulo brothers in 1921. Then followed: Cantando (Singing), Ídolos de la radio (Idols of the radio), Radiomelodía and others. José Gobello expressed: «Vicente Bucchieri was a fundamental factor in the diffusion of the culture of masses». 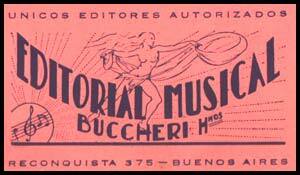 Bucchieri died on September 23, 1985. A small plaza in Pompeya bears his name; it is located on Roca Avenue between Mom and Agustín de Vedia. The neighborhood of Boedo also paid homage to him when on July 5, 1997 named the corner of Boedo and Metán after Vicente Bucchieri. 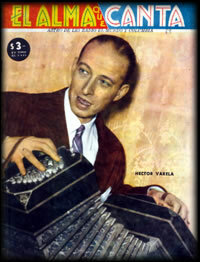 * Magallanes, Ariel: «Vicente Buchieri hizo cantar a todo el Río de la Plata: La leyenda de El Alma que Canta», in Todo es historia, Año 12, Nº 149, Buenos Aires: X-1979; pp. 90-95. * Vargas Vera, René: «Pico de oro», in Música y letra, SADAIC, Buenos Aires: 1989; pp. 22-25. As for the spelling of the surname, Roberto Selles literally comments: «Thirty-two years after the appearance of the magazine, Don Vicente discovered, due to a formal procedure, that his true family name was not Bucchieri but Buccheri. Since then, with this spelling it appeared in the El Alma que Canta issues, causing, consequently, a confusion that misled many ones». 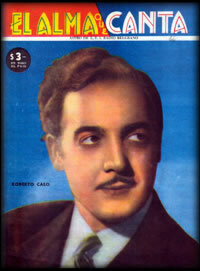 And he later adds: «El Alma que Canta ceased to be published in the mid- 1950. Later it had an ephemeral revival, under the direction of Blas Buccheri, Vicente’s brother». (Selles, Roberto: “El Alma que Canta. La revista que hizo cantar al país”, in ¡Viva el tango! Nº 11, Academia Nacional del Tango, Buenos Aires: 1998; pages 4-15). About the same issue Horacio Ferrer in El Libro del Tango, says: «Semanario. 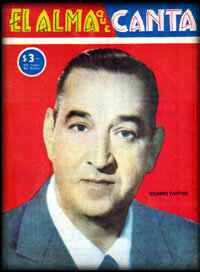 One of the magazines entirely devoted to tango matters. Founded by Blas and Vicente Buchieri, in February 1916, it is still under the direction of the former». (Ferrer, Horacio: El Libro del Tango, Antonio Tersol Editor, Buenos Aires-Barcelona: 1980, Page 373). Furthermore, we have received a message by e-mail from Daniel Marcelo Buccheri (grandson of the above Blas), in which he affirms that the true founder of the magazine was Blas Buccheri. And that his surname was never altered by a mistake or slyness of an immigration officer, but it was Vicente himself (in fact his great-uncle), who added a letter "i" to differ from Blas «because he was always overshadowed by the prominence of his elder brother».